Fair Lake Farm consists of two separate parcels of land in Barry County, Michigan. One of these is a 43-acre parcel located on the shores of Fair Lake near the small town of Delton. This farm produces hay for winter cattle feed. Just two miles away is the other parcel, 80 acres of mixed grasses and foliage being developed for rotational grazing paddocks. Fair Lake Farm strives to be environmentally, socially, and economically responsible. To achieve this, no pesticides, herbicides or inorganic fertilizers are used on the pastures or hayfields. No growth hormones, regularly administered antibiotics, grains or GMO feeds are given to the cattle. A local family owned and operated, USDA inspected slaughterhouse is used for processing. The cattle are quartered and sold locally to individual consumers, or in packages through Anne’s Health Foods in Hastings, MI. The biggest challenge to obtaining local organic fertilizers to provide nutrients and organic matter for the hayfields has been an ongoing challenge. The cattle provide a natural fertilizer for the pastures during grazing. Hay grown and fed to the cattle during the winter is returned to the hayfields as manure the following fall. However, to quickly build the nutrient content and organic matter within the soil, a supplemental source is required. Fair Lake itself covers 238 acres with a mix of homes and woodlands encircling it. The lake also suffers from the invasive aquatic weed myriophyllum spicatum, more commonly known as milfoil. This lake weed grows in dense thick mats across the lakes bottom interfering with recreational activities, while also crowding out native plant species. The Fair Lake Association, of which Fair Lake Farm is a member, made a decision to control the growth of milfoil by mechanically harvesting it rather than applying herbicides to the lake or installing bubblers under the lakebed to disrupt the plants root system. Mechanical harvesting is only effective if the milfoil is removed from the lake after harvesting. If the cuttings from the milfoil are left in the lake after harvesting they can re-root or decompose, adding more growth and nutrients to the lake. Fair Lake Farm has a unique access point to Fair Lake via a causeway built in the 1960s by an earlier property owner. This causeway connects what was formerly an island to the mainland. In 2015 Fair Lake Farm volunteered to collect and remove the harvested milfoil. An available commercial grade mechanical harvester was purchased, and an operator hired and trained to operate it. The areas in front of individual lots are harvested on a contract basis, while the areas of open water are harvested through a funds donated to the Fair Lake Association. The harvester uses three sickle-bar mowers, one horizontal and two vertical, at its mouth to cut the milfoil. The mouth can be submerged to cut at a depth of up to four feet. The harvester deck holds a volume of harvested material that measures 6’ x 20’ x 1.5’. This equates to 6.67 cubic yards of material. During June, July and August, 54 loads were harvested, totaling 360.18 cubic yards of milfoil removed from Fair Lake. Even though most of the water in the milfoil has drained out while resting on the harvester, it is still very wet and heavy. Each load weighed between 1,500 -2,000 lbs. 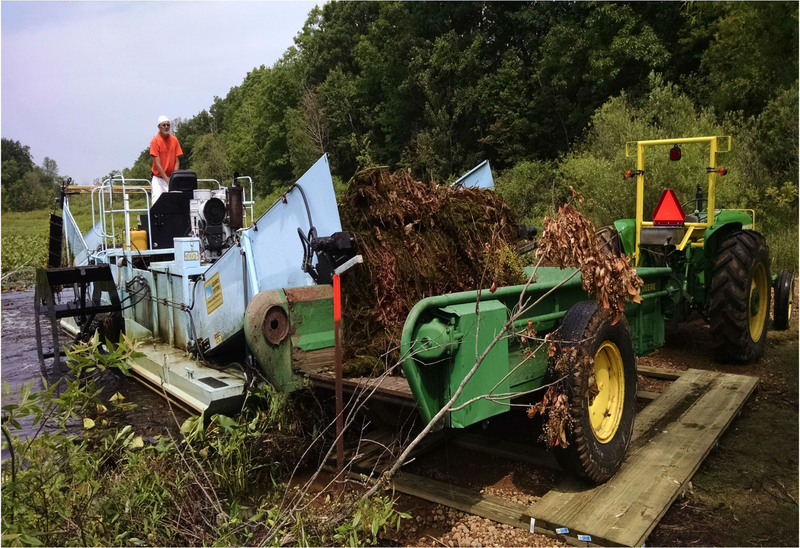 The vegetation was cleared from one end of a channel that runs alongside the causeway to allow the construction of a ramp to remove the cut milfoil from the harvester. 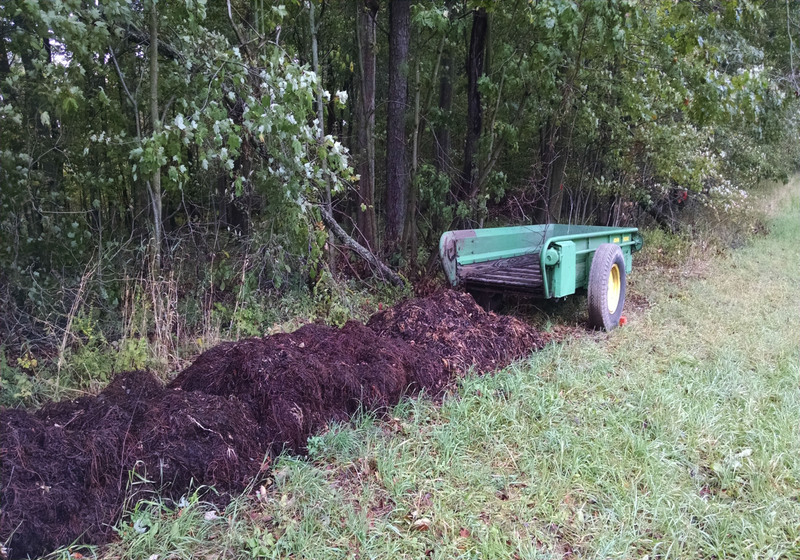 A John Deere manure spreader was modified to transport and distribute the milfoil after harvesting. Each load, which is large enough to fill the manure spreader, is driven about a quarter mile to the hayfield and is unloaded along one side. The remaining moisture drains from the harvested milfoil and it rapidly begins decomposition. The harvested load reduces in volume by about 25% within two weeks, and the internal temperature reaches 120 degrees Fahrenheit as decomposition rapidly advances. Within six weeks, the load has reduced to approximately 50% of its original volume, the internal temperature has returned to the ambient air temperature, and it is ready for spreading on the hay field. Each year a different section of each hayfield will be fertilized using the decomposed milfoil, along with reseeding to ensure a thick crop. To allow for a thorough analysis on the use of milfoil as a fertilizer there will be a field treated to the traditional manure fertilization, as well as a field given no fertilization treatments. A soil analysis will be performed to determine the organic and nutrient content of each field. This soil analysis will help determine the efficacy of using harvested milfoil as an alternative fertilizer.